I asked my friend Beth of Red and Honey what inspires her to creativity throughout the day and I am delighted to have her share her thoughts here today! If you think yourself to be the furthest thing possible from an artist, then this is for you. There is a certain rhythm to the quotidian tasks that I carry out day-to-day. There is the potential for these mundane bits of my day all strung together with diapers and toilet-scrubbing to be uninspiring and unappreciated, and there is potential for them to be the very canvas on which I create my art. I believe that everyone is an artist. If you create, then you are an artist. If you have eyes to behold and express the beauty that is all around you, then you are an artist. 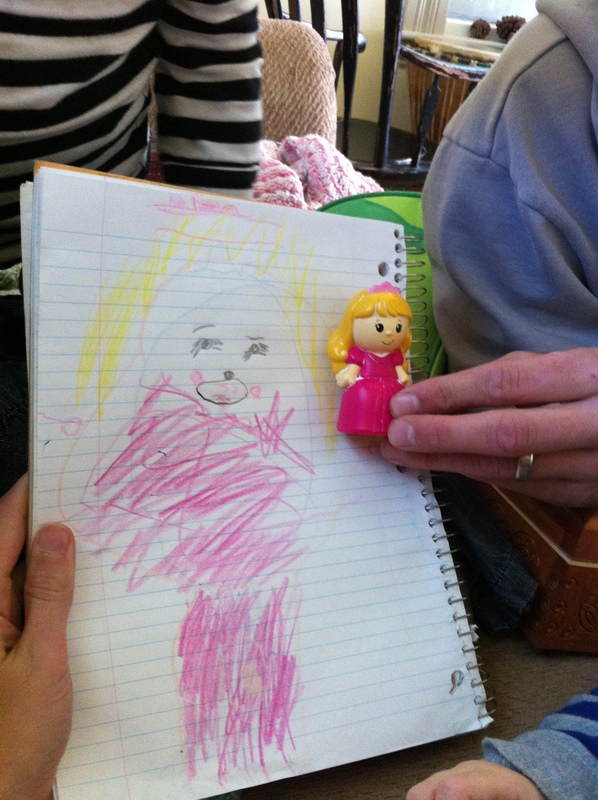 Your children probably have no inhibitions whatsoever about creating and following their artistic instincts. It comes naturally to them, but when we grow up and become adults we sometimes lose that ability. Sometimes it’s hard to feel like an artist in your day amidst the grown-upishness of it all, but I believe it would be a great tragedy for my children to grow up and lose that sense of wonder and creativity. My solution? To model it. To live it. To teach new ways. I like to keep a camera handy to document the moments that stand out in the day. Take photos of things that strike you, things that you see as beautiful, whether it’s the brilliant colors of your fruit basket, the sun’s gaze in your living room, or your child’s hands as he plays. I try to capture all things beautiful, not just the typical memories for posterity. My three-year-old has recently been introduced to “big boy lego” (the small regular-sized lego blocks). Today we built a lego house together, and as I showed him how to do it, I reminded him that he could build it however he wanted. I made the first layer with all blue, then told him to add whatever colors he wanted for the next. “An orange piece!” he said with excitement. Then, “and a yellow piece here!” We added pieces and followed no “rules”, ending up with a beautifully colorful house with a funny looking roof, two doors, and a window. He loved it. 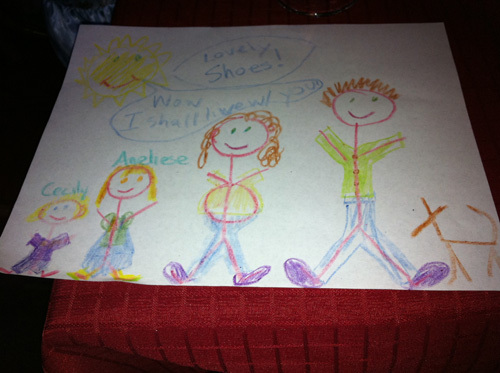 I don’t want to ever tell my kids they have to color inside the lines, and I certainly don’t want to miss out on unique and beautiful art because of expectations that squash creativity. Most winter mornings bring soft pinks and oranges painted across the sky right outside our front window. I have a habit of exclaiming, “oh, what a beautiful sunrise/sky/cloud/day it is!” and I’ve been delighted to find my little guy joining in the spirit. He sees the beauty all on his own now, and I often find him peeking through the still-drawn curtains as the light fills the sky exclaiming, “Mommy, the sky is so beautiful this morning!” As we venture outside for walks and such, I often exclaim over the beauty in the things he points out – the colors in autumn, the buds in spring, the ice droplets in winter, the dazzling sunshine and flowers in the summer. As we observe beauty in creation, he learns to make art in his soul, by having eyes to see it. With music playing more often than not in our days, there is ample opportunity for toe-tapping and head-bobbing. When I see the kids move their bodies to the beat of the music, we bust out into a full-on dance party. By allowing myself to let go of inhibitions and dance however the music moves me, I teach my kids to be free to express themselves through their movements. Hopefully I will teach them that their bodies’ movements can be a beautiful form of art – from the way that they carry themselves around others, to the way they express their physical selves. Whether they are as uncoordinated as their parents or not, dancing freely in your living room is surely an art form that is most honoring to the One who gave you that body with the ability to hear and express the music in your soul. Make art by speaking love into someone’s life. Say why they are beautiful to you right then and there, whether it be an appreciated aspect of their character, a particularly lovely act, or simply a sparkle of life in their eyes. 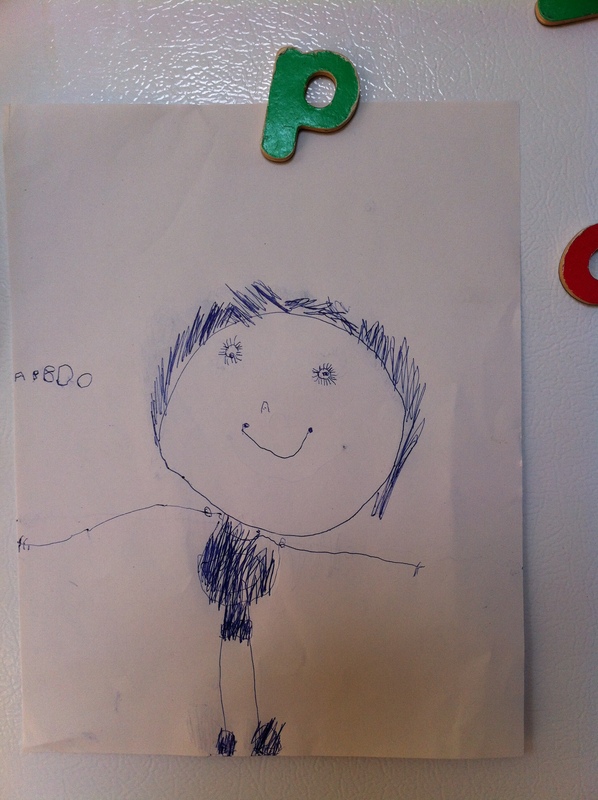 I see my son as a masterpiece work of art, and I love to tell him so. 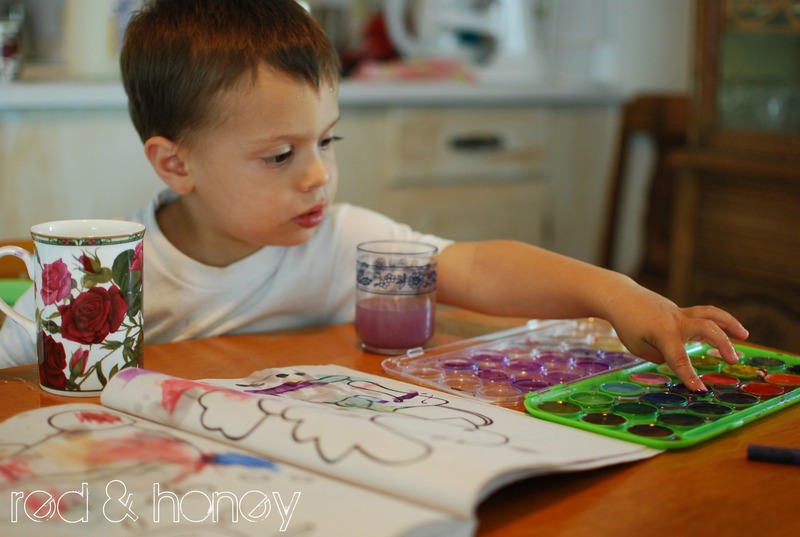 My kids love to do what we call “special art”, which is any artsy-crafty project that involves more than just crayons. Add in some glitter or stickers or glue, and they seem to be infused with an extra dose of inspiration. 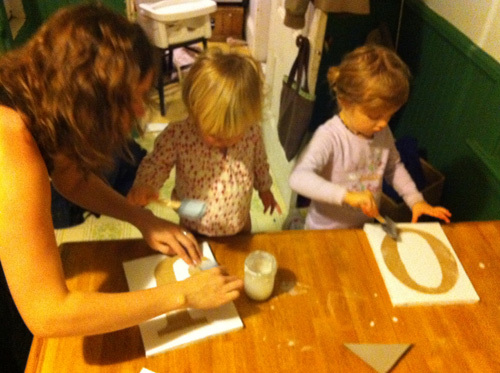 It helps when Mama is willing to sit down with them as they create, giving personal commentary and interaction as they work. 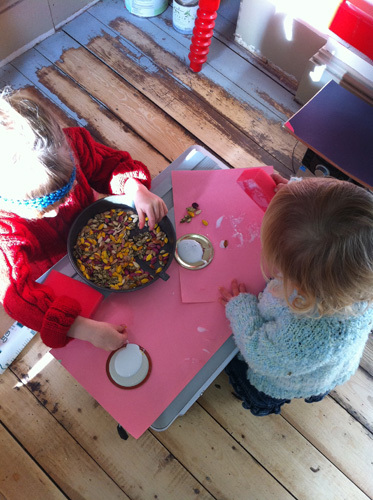 Sometimes art can be made simply by sitting quietly for a few moments. It can be tough to do with the preschooler and under crowd around, but it’s possible. Glean those little moments as you are able, and just sit. Look around you, let your senses take in the gifts of beauty all around you. Let your eyes see things that you’ve looked past all day long, and breathe deep with gratitude for your many blessings. A moment as such is a thing of beauty, and a work of art. Share your thoughts with your children to teach them to do the same. As you go about your daily mundane tasks, sing songs that make your soul sing with passion and inspiration. Dare to make art by saying yes to the music and pressing it deep into your soul, allowing it to leave behind its messy palette and paint. Show your children that even the most drudgery of moments can be made beautiful by the attitude you are cultivating in your heart. Say it out loud (or write it on a blog!). Tell people what you are dreaming about, what makes you giddy with excitement, and what makes you come alive. Tell your children that dreaming is mandatory in your household, and that true art requires a certain letting go of inhibitions that typically hold people back from ever creating a masterpiece of their lives. Don’t be afraid of dreaming massive and crazy things. Be afraid of sticking yourself into a box and shutting the lid. Show your children that beautiful things can happen when you step out on a limb and walk toward a goal. What are the ways that you make art? Would you call yourself an artist? Why or why not? 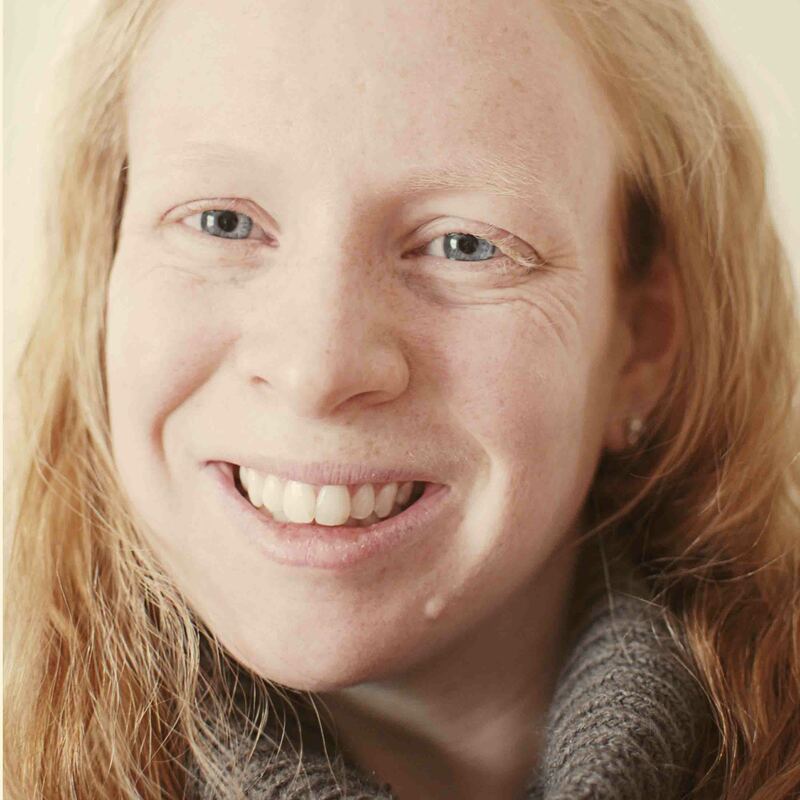 Beth is a natural redhead, wife to a pilot husband and mama to (almost) 3 little ones. She is passionate about missions, motherhood, and finding the beauty in everyday life. 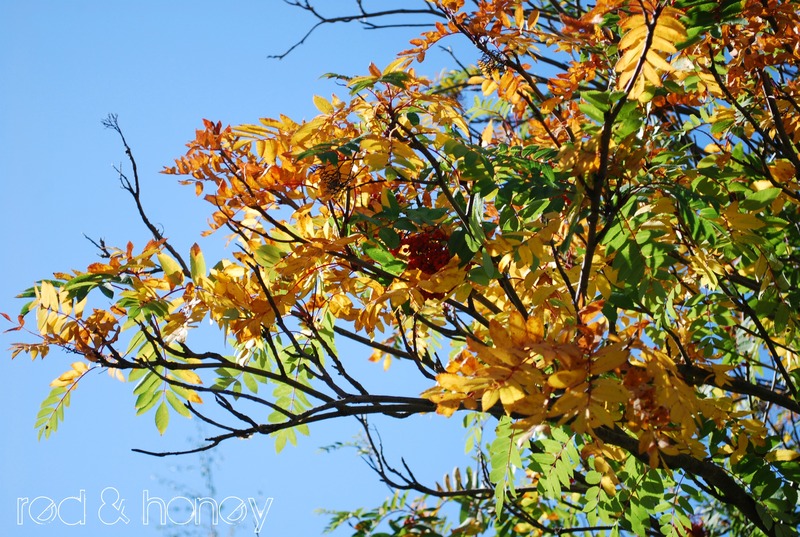 She blogs from the Canadian prairies about the art and soul of audacious homemaking at Red & Honey. 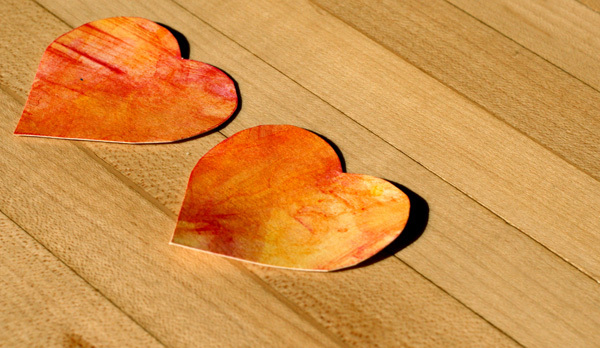 I have mentioned before that February is the month of LOVE and generally we have fun decorating with hearts and such. 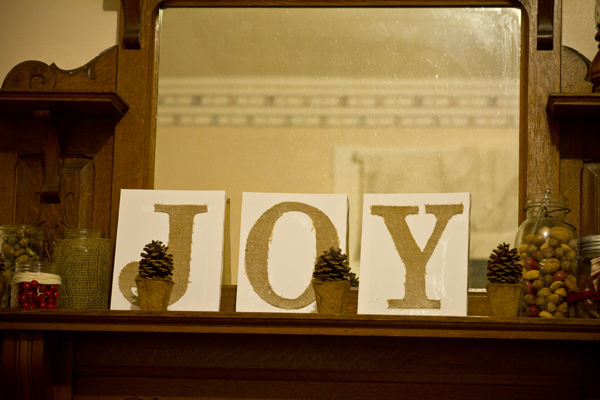 This month, with just moving into this side of the house, there hasn’t been a lot of time or energy for decorating (not sure where the things that we made last year are tucked away). So when the 14th arrived for the above reasons and some besides, I wasn’t feeling very Valentines inspired. Dan made all of his girls a heart pancake breakfast in bed which was sweet for all of us and that was the extent of our celebrations:). 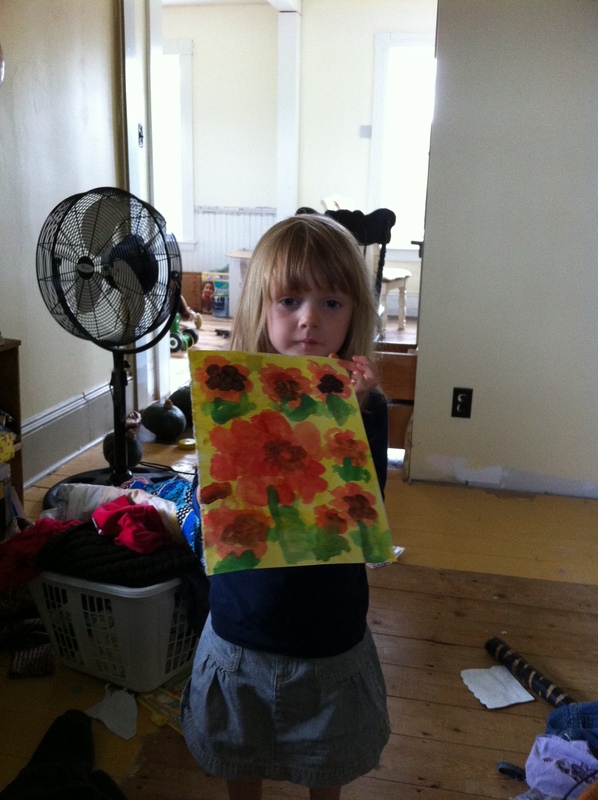 The girls of course needed their art time in the morning where we tried out their new GLOB paint in watercolor form. I had them paint the whole page and once it dried, I cut hearts out of it. We then enjoyed the beautiful day outside in the snow and collected some branches for the stems of our bouquet. 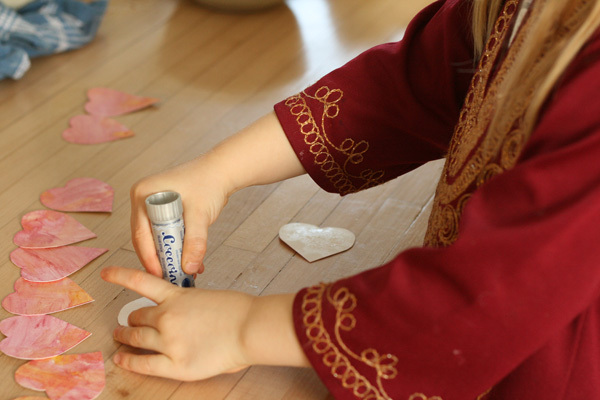 In the afternoon Aneliese and I applied glue the hearts and double sided them on to the branches. Glue sticks are always fun. 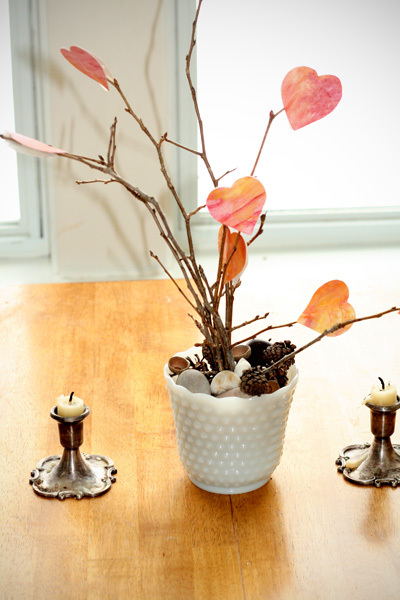 Using our vase that holds our outdoor treasures such as pinecones, shells and ocean rocks, we created a simple and pretty centerpiece for our table. Also celebrating the amazing birth of my dear friend Dea’s precious son! 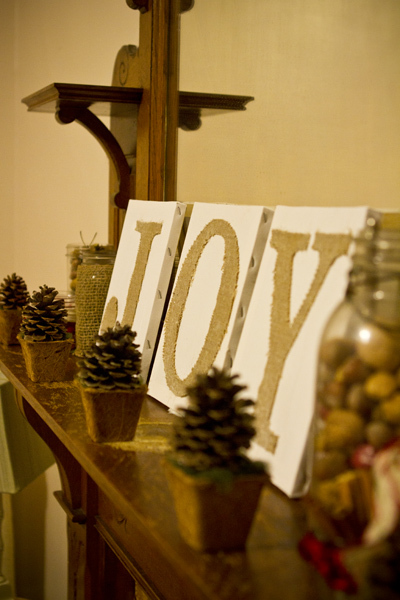 One of my favorite materials to decorate with is burlap, I just like the rough, earthy look of it. I have been hauling around some old sacks that the previous owners of our house in BC had left behind and had decided that I was finally going to cut one up only to discover that I am not sure which box they are still packed away in. 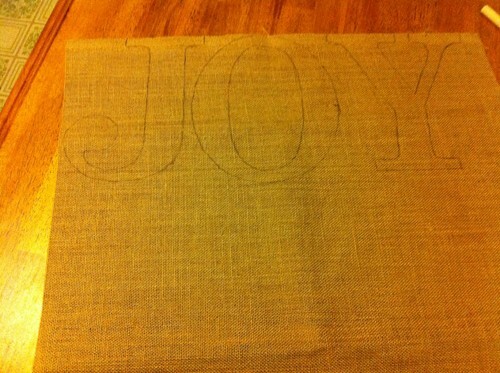 My heart was kind of set on making up my word in burlap on canvas for the Advent season so I went and bought some burlap (actually it really is jute which is a tighter weave) and have been waiting for a few minutes to put it together. I am pretty pleased with how it turned out as well as how very easy and quick it was to do! Burlap or Jute (finer weave) or whatever other material you would like. 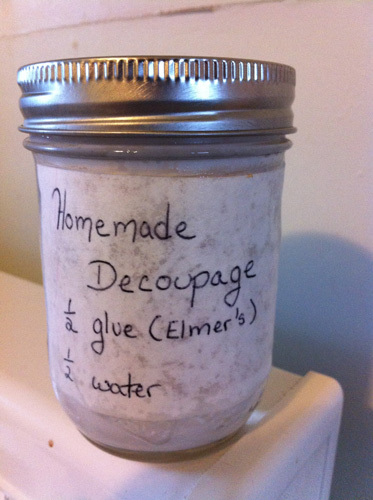 Mod Podge or a much less expensive DIY Decoupage that I found HERE(Gotta love Pinterest! 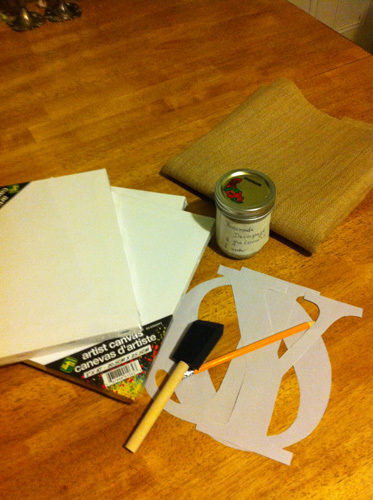 Trace or draw letters onto Burlap. 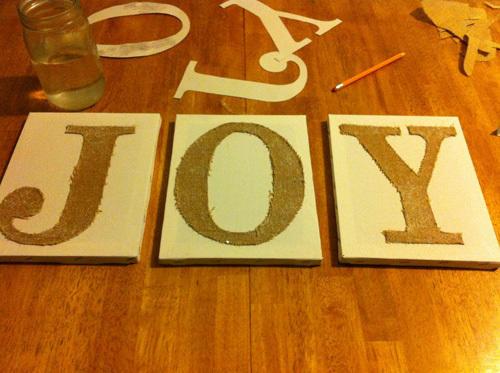 Cut letters out while enlisting any little ones that you may have to spread decoupage on the canvas…it’s kind of like painting. 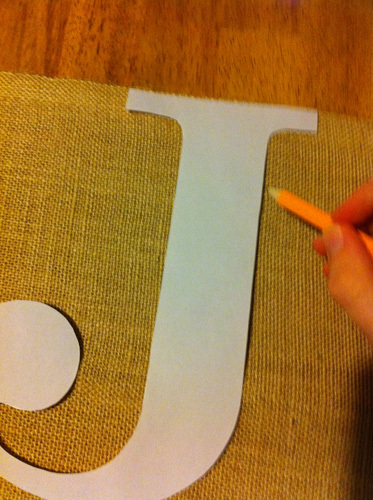 Position letters on the canvas and pat into place. 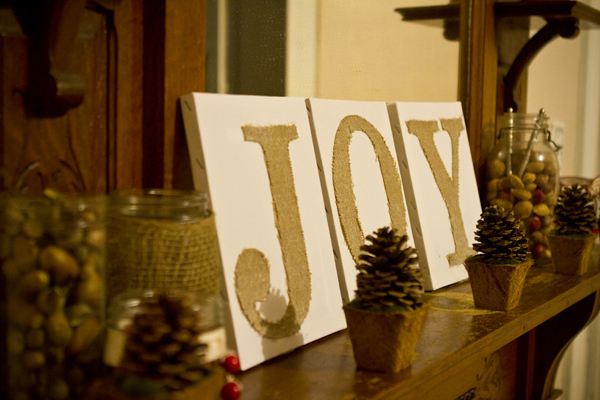 Allow to dry and you are ready to decorate! After tracing this I thought that a table runner like this would be fun...maybe a project for...next year. More "painting", At some point they both stuck their foams in the jar and dumped at least half of it...good thing it was cheap. The canvas frames were the most expensive component at 1.25 each and so I spent between 5-6 dollars total. We spent about 20 minutes working on it together. I then did some quick decorating and attempted to take some artsy pictures…Dan said that I did pretty well:). I haven’t been brave enough to try out the crayons again yet and the past week has been just a little too tired for a lot of art supply making or arting to be truthful. But Aneliese has been thinking that play dough would be fun and I agreed. It is also one of those fun things that they are happy to do on their own when pregnant mama is just feeling kind of tired (that is allowed right since I only have seven weeks left to go!!). Pink-Alkanet Root, Green-Spinach Powder, Yellow-Annato Seed and Tumeric. Again not vibrant, but not garish either. 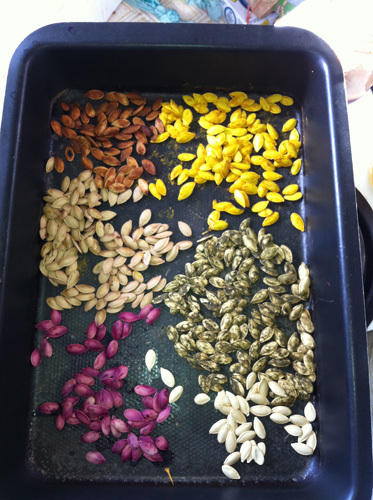 I am finding that I am getting a nice depth of color with the natural dyes that I am trying. 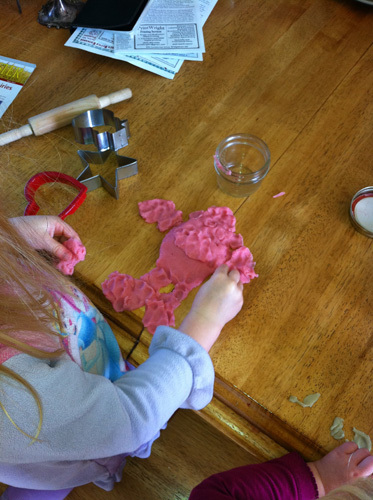 Play dough is a pretty easy one to make and I know that is a common art supply that many mamas already make. Its nice too because the ingredients are common in most kitchens. The only real difference with mine is that we need it to be gluten free which can be a bit more challenging find a good recipe or to buy. 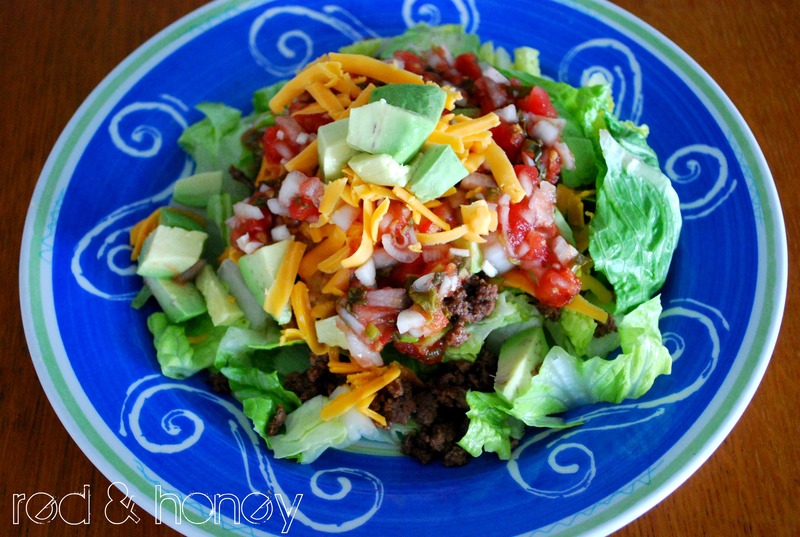 I have made this recipe more than once and it has worked well each time. I stored it in the fridge for several months and it kept well but is always a bit crumbly while it warms up so I am going to try keeping it a room temperature. 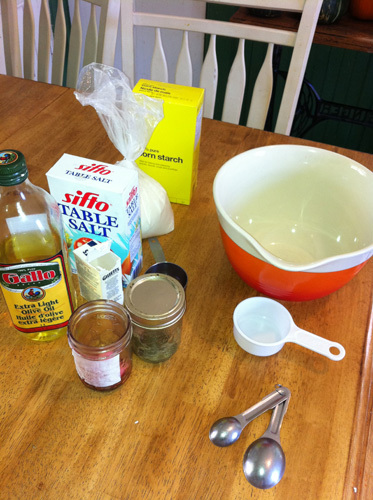 Preparation: Mix ingredients. Cook and stir on low heat for 3 minutes or until mixture forms a ball. Cool completely before storing in a sealable plastic bag. So now here is what I did a little differently. 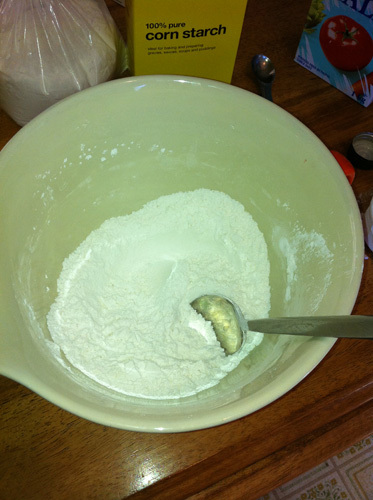 I mixed the dry ingredients together while boiling the water. 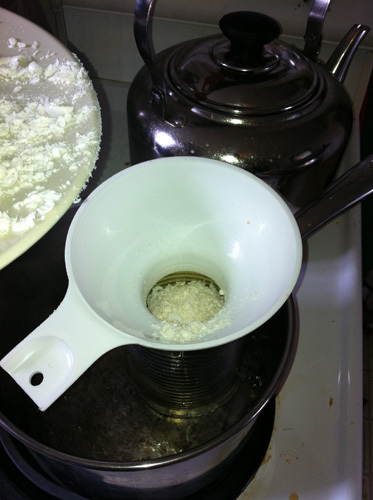 I added the oil to the cup of water and then added it to the dry ingredients. I had hoped to skip the cooking step altogether but it wasn’t quite working so I cooked it on low heat for a couple of minutes. The end result made for the smoothest homemade play dough I have made yet (and I have made a bit) so I really would suggest taking a couple minutes longer to boil the water and then mix before cooking. If you want just one color, I would also suggest adding it to the boiling water so that it easily and evenly dispersed through out the dough; I wanted three colors so I didn’t do this. And there you have a quick and easy art supply. Again I used my dyes that I am still working out…but getting closer all the time…but you could use food coloring (I know that there is a nice plant based kind as well) or kool-aid (I choose not to because my girls still tend to like sensing with their tongues! 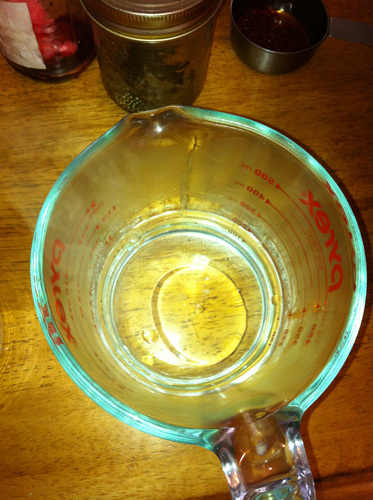 ), and you can even add some essential oils. 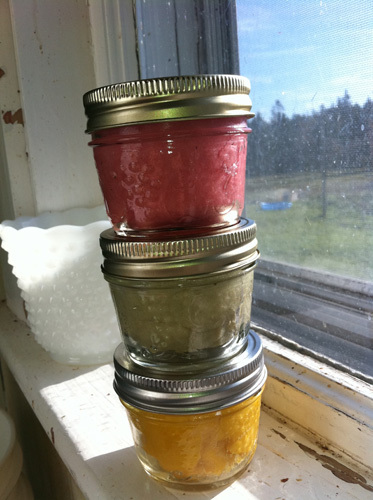 I also found this great sitethat has a regular play dough recipe and lots of different natural dyes that she has tried. The little jars that I used are inexpensive, re-usable, very cute. Does anyone else think a nice stocking stuffer, maybe even a candy cane theme of red and white striped with a hint of peppermint scent? 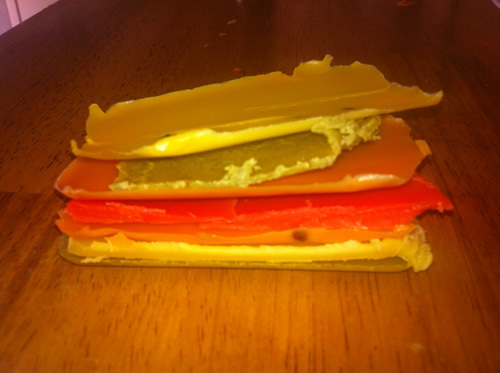 If you are interested in reading about the other natural art supplies that I am trying, you can read my intro, modelling beeswax, and my still needing perfecting beeswax crayons posts. They look like poop. At least that is what Cecily says and she would know as she has done that very thing on the floor enough times while potty learning. 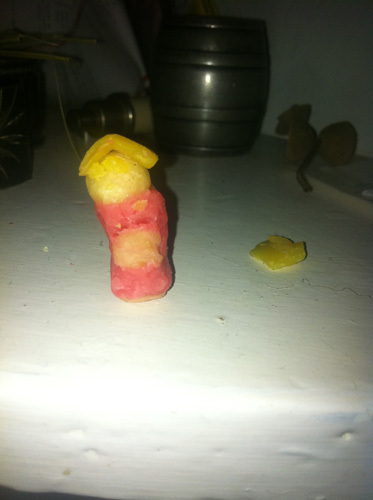 We are almost out of crayons so I pulled out my five pounds of wax, did some research and went to it. 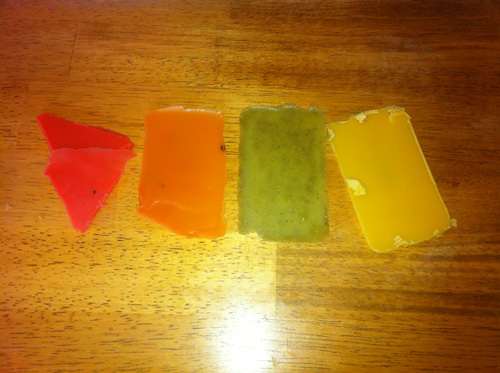 Melt some beeswax, equal part of soap, add a little color, and pour into the molds. Easy. I had read that glycerin soap would make the crayons harder and less sticky so I found a bar of goats milk glycerin soap that had no color. I grated it up all nice and added it to the pot. It would NOT melt! Little chunks stubbornly refused to be assimilated with the beeswax. Finally I gave up and added some color before transferring it into my ice cube tray mold. I secretly was hoping that it would be transformed while hardening. It didn’t and when Cecily saw them, this is what she had to say, “Look Mama, my poop!”. Coloring with poop. Lovely. For they do actually color and other than the streaks of white soap don’t look too bad. They also smell most strongly of soap. I won’t be defeated though so this week I am going to try again…I will let you know how it goes. 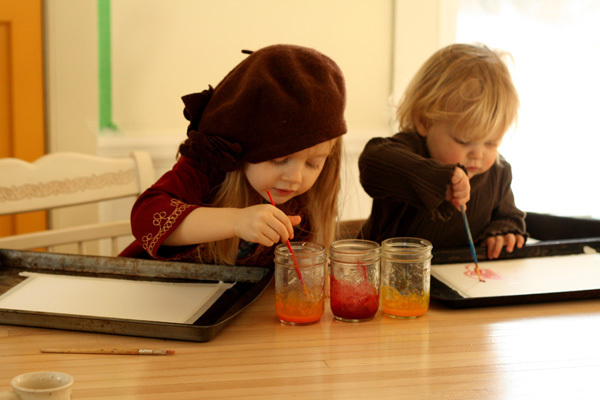 Have you ever tried making crayons, do you have any tips that might make the next attempt a little more successful? If you would like to read my early post about natural art supplies, here is my intro and my much more successful modelling beeswax. I have had five pounds of beeswax sitting around waiting to be made into candles while I keep my eyes open for an old taper mold or learn how to dip them. But I decided last week that the time had come to create with it even if it wasn’t making candles. 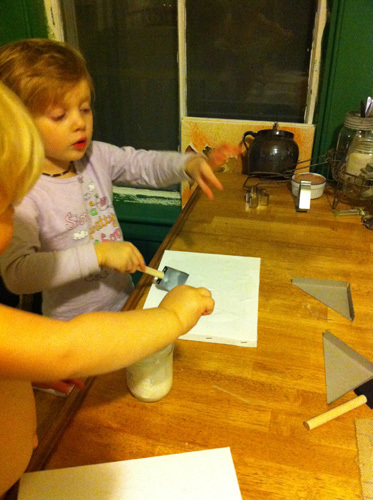 Modelling beeswax is an often used art form in Waldorf style schooling. 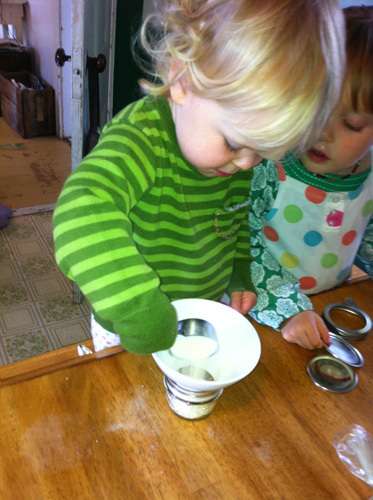 Unlike the more popular play dough, beeswax must be slowly warmed in order to be molded. This goes well with the idea of intentionally and slowly moving through our days and activities as opposed to the moving quickly through activities as young children (and adults) are prone. If you are using a crock pot, which I found worked really well, set it on low and allow it to melt. This probably took about 20 min. I also used a tin can in a pot of water that I tried to keep a slow boil. Line muffin tin with the paper (just do it, I tried it with out and just oiling it…not a good idea). 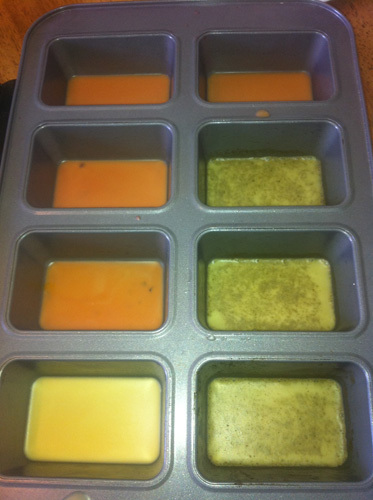 Once the wax mix has melted, add your colorings…it is easiest if you are doing only one color because then you can just add it to the crock pot, otherwise you have to divide it up. Pour a thin layer of wax in each tin. Keep it just a thin layer. Allow it to cool completely before removing. If you aren’t happy with the colors or think it needs more beeswax, you can easily remelt it in the oven on a low setting…just watch closely, it only takes minutes. 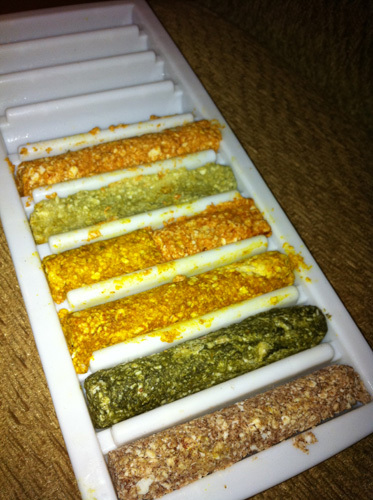 red:Alkanet root, Orange:Alkanet and Annato, Green:Spinach Powder, Yellow: Annato Seed and Tumeric. I still need to fiddle with colors but I thought they were pretty, not vibrant really, but pretty. Now the fun part! Taking a small piece of the modelling wax, hold it in your hands until it softens. This varies depending on the warmth of your hands. Slowly begin shaping it to whatever you want to make, it will become more flexible as it warms. You can form and add different colors as you like. This was our little tester that Aneliese and I made together:) ; a little girl with blond hair who went for a walk wearing her red coat and no shoes or mittens! This isn’t so much for independent play with small children. Cecily isn’t quite ready for it but Aneliese enjoys holding it in her hands to warm while I tell her a story about whatever we make and right now she really likes to make things together. Her little hands warm it much faster than mine but I noticed today that putting my hands in warm water before helped a lot. 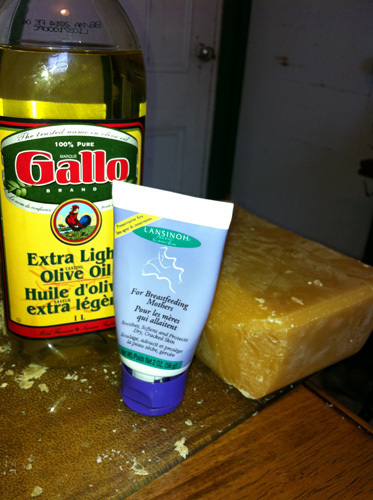 It will also leave your hands feeling a little sticky; it is beeswax but it very quickly absorbs into your hands. I also found it a little messy to make and I’m glad that I have an old crock pot for this kind of thing. And the cost; I spent about 3-5 dollars max. as opposed to the 15-20 dollars that I wanted to spend on this which granted is beautiful looking and of course would be a lot less work! Still, I would mark this one up as being worth while. What do you think? Does it seem simple enough that you would be willing to try it? If you do, please, let me know how it goes!